Worship in spirit involves giving ourselves wholly over to God and abandoning ourselves to his mercy, grace and joy. Worship in truth means our worship is based upon the revelation of Jesus in the Bible. Worship is central to what we do together as a church, and therefore it is central to what house churches do together. Unfortunately, the average, modern-day American Christian has become somewhat confused by the bewildering amount of information about worship. “Worship” can now refer to a style of contemporary Christian music. “Worship” has also been artificially distinguished from something else called “praise.” For many people, worship is synonymous with singing. For many others, worship involves litanies, bowing, sitting, kneeling and standing. For some, worship is something that we do for God. For others, worship is something God does for us. It is time for some clarity concerning worship in general, and hopefully this clarity can lead us to a practical way to truly worship God in our house churches. Sing joyfully to the Lord you righteous; it is fitting for the upright to praise him. Sing to him a new song; play skillfully and shout for joy. There are far too many references of this sort to list in full. 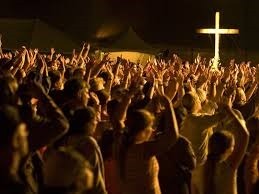 Again, the point is that worship is an interaction between God and us. God does something for his people, or he reveals a certain attribute of his nature, or he makes his presence known or felt in some way and then his people respond through singing, praying, kneeling, playing instruments, dancing or in a variety of other ways that are all exhibited in Scripture. We also find in the book of Psalms people crying out to God for help. This too, is a form of worship, and it involves the same elements of worship. When we cry out to God for help, we are actually exhibiting faith in his goodness and his power to help us. What exactly did Jesus mean by this? When Jesus said we must worship in truth, he meant that worship must proceed from an acknowledgment and acceptance of the truth about ourselves, God, and this world. And the truth about those things comes from the Bible. The Bible says the only way we can have a relationship with God is by God’s grace through faith in Jesus Christ (Ephesians 2: 8-9). Therefore, true worship cannot take place without faith in Jesus Christ. Without faith in Jesus Christ we are “dead in our transgressions” (Ephesians 2: 1), that is, spiritually dead. To truly worship God we must be reconciled with him through the death and resurrection of Jesus Christ. If we do have this faith and we are reconciled with him then true worship is possible, and it is based, not on correctly performing external ceremonies or singing certain kinds of songs, but rather on the truth that we are sinful people who have been saved by God’s grace through the death and resurrection of Jesus Christ on the Cross. In addition, worship must have at its heart the central truths and themes of Scripture: God’s goodness, our need for him, his love and joy, and so on. Worship in spirit means that we are responding to God in a way that goes beyond simply thinking about him with our mind or going through external motions. Worship in spirit involves giving ourselves wholly over to God and abandoning ourselves to his mercy, grace and joy. It means that we have allowed the truth of God’s word to penetrate our lives to such an extent that our will and emotions respond. Worship in spirit is relational as we truly interact spiritually with the living God. To worship in Spirit also means that we allow God’s Spirit – the Holy Spirit – to direct our hearts and minds as we respond to Him. Worship without Spirit is dead formalism. You may have experienced such a thing at times, where it felt to you like you were simply going through the motions with no enthusiasm. Worship without truth is empty emotionalism. This too is an experience some people have. You may feel like all the hype and excitement is really empty and pointless. Real worship involves both Spirit and truth. We need to remember that worship is not a neutral activity. One way of looking at it is that worship stirs things up in the spiritual realm. Worship can help us feel closer to God, it can lead us to a place of repentance and it can often release spiritual power. The devil does not want these things to happen, nor does our sin-riddled flesh. Therefore, when we set out to worship it is normal to expect a certain kind of opposition. We need to recognize this and rebuke the devil and resist the impulses of our own flesh. 2. Remember and Think about the greatness of God. This involves recalling the truth, reading and listening to Scripture, and it is an act of the mind. This means, we don’t just sit around and wait for some worshipful emotion to strike us. We actively read and listen to scripture, we actively think about God, who he is and what he has done. 3. Experience and visualize (enter in to) His presence. This is an act of emotion. In other words, let your emotions get engaged, if you can. God’s love is truly overwhelming. Many people have no trouble getting very excited at a sports game, but allow themselves to feel nothing when they come into the presence of the God who created the entire universe. When emotion is guided by a will and mind for worship, it is a good thing. Sometimes it is useful to use your body to help focus your emotions on worship. When I am not playing guitar, I often lift my hands in worship. I almost always do that, not because I feel tremendous emotion, but because I know that if I honor God with my body (the lifting of hands, or lying or kneeling) emotions of worship often follow. And that is what often happens. 4. Release the Spirit to lead. This is a spiritual act. It is also an act of faith. To let the spirit lead is to consciously invite him to lead your thoughts, will and emotions. When you get a little idea or picture or feeling that you think might be the Spirit, go ahead and follow it. The great thing about house-churches is that you can do that, and if you make a mistake, it’s okay. You and your church will figure it out. So maybe, at the Spirit’s leading, you suggest singing a song, or repeating a verse, or praying. Here’s a practical example of letting the Spirit lead. Last Sunday, I did not pick the songs for worship. For various reasons, I didn’t even know what the songs would be until about an hour before-hand. I’m sorry to say, I was busy getting ready for church, so I just printed them out. But during our singing time, one of the songs was “Surrender.” As we were singing it, I felt the Lord prompting me to pause and invite people to name things that they wanted to surrender to the Lord. So I did that. The great thing about house-church is, it doesn’t have to always be the worship or music leader who does this. Anyone can be prompted by the Holy Spirit. When we approach worship this way, we find that style becomes far less important. It is true that some people prefer contemporary praise songs, while others prefer litanies and hymns. There is nothing wrong with these preferences as long as we are willing to subordinate them to the greater cause, which is to worship the Lord. The main thing is what we’re doing (worshiping the Lord), not how we’re doing it. By the way, that last paragraph is a challenge for me. When I visit other churches, or attend conferences, I often find myself not appreciating the style of worship. I’m not much for liturgy, but a lot of contemporary worship seems to me to be performed too loudly, and in musical keys that are far too high for the average person to sing comfortably. I get the message that my singing is not really intended to be part of the worship service, because I can’t even hear myself, let alone the people around me, and often the band will go off into a solo while the rest of us just sort of stand around. Now, as a pastor and theologian, I have issues with that approach to worship. However, as a worshiper, I have learned that I can worship in that environment anyway. Because worship is more than singing, and more than style. If I apply my will, my mind, and my emotions to worship, and follow the Spirit, I can worship in Spirit and in Truth, even when the style bothers me a little bit.